Is your closet a disaster? We're here to help. Below is a list of tips and tricks to help you get better organized. This blog includes actual photos of one of our clients' closets. Her standard size walk-in closet started out in disarray and ended completely uncluttered and organized. 1. Downsize if possible. Take an inventory of your clothes. Make room so you can lay out all your items. This works best by using rolling racks or by simply laying it all out on your bed. If you come across any items that haven't been worn in the last 6 months to a year, consider donating or selling them. This is our customer's "Before" closet picture. Notice the shoes thrown in the floor, a flimsy plastic bin used in place of wooden drawers and unused clothes just thrown on the top shelf? This is what most closets look like before our installs. You're not alone. 2. 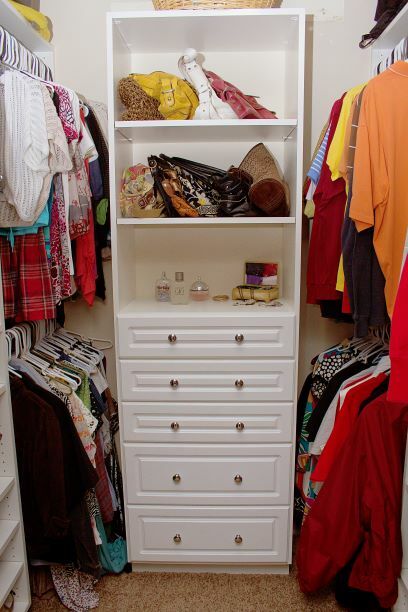 After you've downsized, take into consideration where items need to be located in your closet. Tops shelves are mostly used for lightweight, seasonal items such as hats, storage bins or baskets. Middle shelves (from your shoulders to your waist) should be used for frequently in season items. Bottom sections work better for larger items like luggage or laundry hampers. After we added an adjustable shelving unit, this customer was able to place her sweaters and scarves on the top shelves and her shoes in the middle and bottom shelves. This particular client had additional storage for her larger items, making more room for her numerous shoes. 3. Once you've taken an inventory of everything, organize it by season. If it is summer, leave your summer and spring clothes at eye level. Place the winter and fall items either above or below your summer items. This will keep your noncurrent items out of the way. You can even make it more aesthetically pleasing by color coordinating your clothes. After removing all clothing from the closet, our customer was then able to replace them by season. It was currently summer when we installed this closet so the client hung their summer clothes on the top rod and fall/winter clothes on the bottom. It's best to separate by seasons. That way you aren't having to dig through clothes each day to find something weather appropriate or re-wearing the same items. 4. Take a moment to review your closet layout. Does it really work for you? Do you have enough drawers, hanging or shelves? You may want to consider a closet remodel. Drawers can be used for many items including lingerie and jewelry. Dresses and pantsuits take up more vertical room than most people think. You can add more long hanging sections to your closet if you have several of these. If you would prefer to fold bulkier items such as sweaters or blankets, think about having an adjustable shelving system installed. This allows you to customize the height your shelves need to be set. This also works great for boots and handbags. Our client was begging to get rid of that plastic drawer container she originally had in her closet. It was flimsy and didn't hold very much. Now she has her own drawer unit with shelving above for additional storage. She also upgraded from plastic closet rods to our durable metal rods. This provided her more stability to hold additional clothes. 5. Is it time to accessorize? If you notice you have several scarves, belts, or ties that have no place to go, consider getting belt/scarf or tie racks that install directly onto your closet shelving. Valet rods are helpful when choosing the clothes to take on vacation/business trips or even just hanging your clothes out for the next day. It is a retractable rod that slides out and closes with ease. Jewelry trays are also very popular today. You can purchase slide out trays to place your jewelry on or even velvet jewelry tray inserts that fit directly into your drawers. Classic Closets in Haleyville, AL offers all of these accessories and more. Visit our website at www.classicclosets.net for more closet and accessory pictures.